Solvay KetaSpire® KT-820 is a low flow grade of unreinforced polyetheretherketone (PEEK) with excellent wear resistance, fatigue resistance, high purity, and excellent chemical resistance to organics, acids, and bases. Solvay KetaSpire KT-820 PEEK is available in transparent and opaque grades. The natural grade was chosen for processing. A diagram depicting Solvay KetaSpire KT-820 PEEK is shown in Figure 1. Figure 1. Solvay KetaSpire KT-820 PEEK diagram showing the consistent nature of the sheet at 6.8mm thick. Solvay KetaSpire KT-820 PEEK is suitable for laser marking, producing a high contrast mark on the surface of the material. Laser marking of KetaSpire provides a processing method that does not require tooling and enables the creation of small, fine geometries that can be challenging to achieve using traditional mechanical methods. Universal Laser Systems (ULS) makes it simple to consistently and repeatedly process this material with a high degree of dimensional accuracy. There are several formulations of Solvay KetaSpire KT-820 PEEK; however, only pigmented formulations are suitable for laser marking. 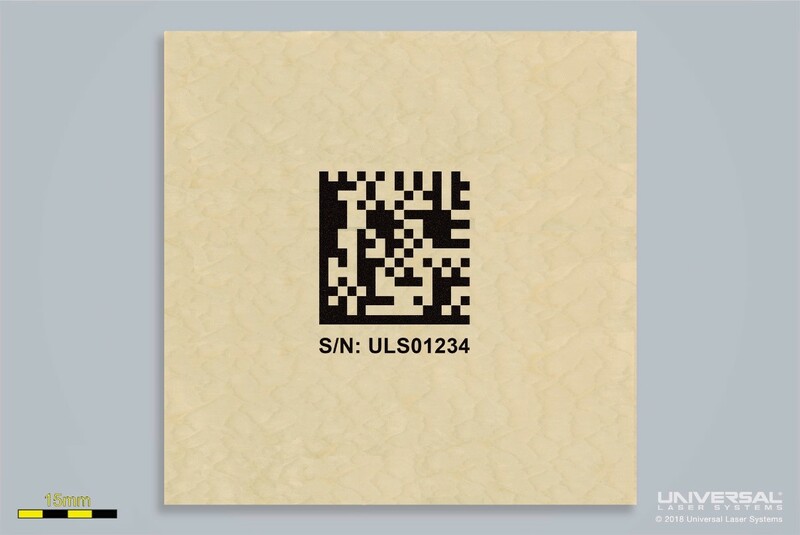 Other processes, such as laser cutting, are not suggested as they do not provide acceptable results with the wavelengths and power levels available from ULS. Solvay KetaSpire KT-820 PEEK was tested to assess laser processing compatibility and to determine the best system configuration of laser wavelength and wattage. Pigments in Solvay KetaSpire KT-820 PEEK readily absorb the 1.06µm laser wavelength and, when configured with either 40 or 50 watts of 1.06µm laser energy, create a high contrast mark on the surface of the material. This laser marking does not produce debris, and therefore does not require post-processing. An image of KetaSpire KT-820 PEEK after processing with settings designed to produce high contrast marking is shown in Figure 2. Figure 2. Macro image of the laser processed surface of KetaSpire KT-820 PEEK. The text in the image is 12-point Arial font and the verifiable 2D Data Matrix measures about 25mm square. KetaSpire KT-820 PEEK is suitable for laser marking and was tested to determine the optimal processing configuration. Through this testing it was determined that laser processing is viable for this material using the 1.06µm laser source to produce high contrast surface marking.